Every year, we go to the Worsley Christmas party with all of Kyle's siblings and their kids. We have dinner, a program, play games, and open our exchange gift. For the program, the kids usually dress up and act out the nativity scene. Sammi's cousin who is a week older, Jace, was baby Jesus. After the program, we played a white elephant game. Sammi won an Easy Bake Oven. We had a lot of fun. These are all the grandkids who participated in the Christmas program. They are sitting with Great-Grandma Chapman. 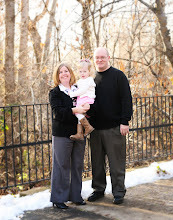 My family went to my brother Doug's house for Christmas Eve. We had dinner and played games. 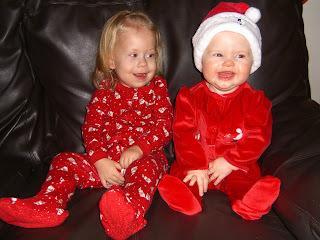 Later, Sammi and her cousin Avery changed into their Christmas pajamas. We opened presents Christmas morning. Sammi was so excited that she kept waiving her hands and arms. She got lots of toys, a new outfit, and socks and tights for Christmas. She loved her toys and wanted to play with them. This is our Christmas tree. Every year we get a new ornament to add to the tree. This year, we got a baby ornament for Sammi for her first Christmas. Sammi just before we opened presents. Sammi playing with her presents. In the picture, you can see her new stocking that Grandma Worsley crocheted for her. It is pink and has her name on the top. It matches the ones Kyle and I have that she made. Sammi is in her car seat ready to go to Grandma & Grandpa Worsley's for Christmas breakfast. All the grandkids at Great-Aunt Ileene's house on Christmas morning. 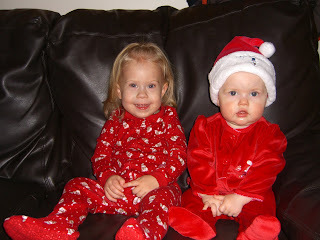 Sammi and her cousin Carley. 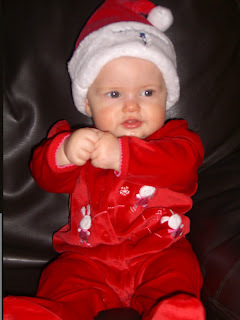 We took pictures of Sammi in her Christmas pajamas and Santa hat. She looked adorable. Samantha is 9 months old. Time has really gone by fast. She recently cut her first tooth. This has been a painful process and one that has made her pretty fussy for about a month. She is still army crawling and is on the verge of really crawling. She gets on her hands and knees and just rocks back and forth. Every time we think she is going to crawl, she just gets back down on her tummy and goes. We think she will figure it out sometime soon. She loves to imitate the sounds you make. If you do a squeel, she will make the same noise back to you. She then waits for you to repeat it to her. It is her favorite game. She also does this with many other sounds including a razz, whoo, and dadadada. Her new thing is clicking her tongue and having you repeat it. She loves to say dada and does it constantly. I try to have her say mama, but she just gives me this look and says dada (even though I am the one she cries for). When she is upset and wants me, she calls me nunun. It is her version of mama. Sammi has also learned how to do peek-a-boo. When she is bundled in her car seat with her blanket, she will cover her face until you say peek-a-boo. Then she will put it down and just smile. She loves to do it over and over. Sammi is such a busy body and hates to sit still. She is constantly on the go trying to find new things to search and explore. She has been such a light to our lives and definitly keeps things hopping. 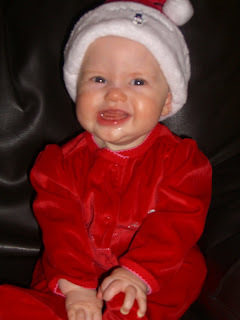 This is Samantha in her Christmas dress. She wore it to church the Sunday before Christmas. The first picture is Sammi doing the "cheese". It is her cheesy smile and she will do it when we say "cheese". It is so funny. December 17th was our wedding anniversary. It has been 8 years! I can't believe it! To celebrate, we went to see the lights on Temple Square. It was really cold and we had to make sure Sammi was really bundled up. She loved all the Christmas lights! She would just stare at them. We had a blast. Kyle has these Shrek slippers that he wears at home all the time. One day, Sammi was sitting on his lap and put her feet in them. She looked so funny that I had to take a picture. 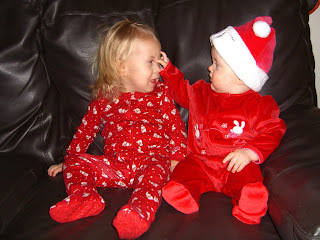 I know it has been forever since I updated Sammi's blog. It has been a little crazy with all the holidays. Anyway, here is what our little family did over the past months. Enjoy! On the week of Thanksgiving we went to Bear Lake for a little vacation. Our neighbors have a timeshare and they let us use it. We went up on Monday and came home on Thanksgiving day. We had a blast! It was so nice to just get away and have some quality family time. We took Sammi swimming and she had so much fun. She would just laugh when Daddy pushed her around in her floating device. We also went to the beach of Bear Lake and took some pictures. It was really cold and windy up there. Most of the time we just relaxed by watching movies, playing games, and having fun with Sammi. It was one of the most relaxing and fun vacations we have been on. Sammi all ready to go swimming. This is the beach of Bear Lake. It looks nice out, but it was so cold! it would be fun to take pictures by the fireplace.